Relative Humidity measurement and control used to control different modules such as Ionizers, Dehumidifiers, Humidifiers or other units that will be switch on or off depending on the set point the Control Box. This microprocessor based Humidity switch can be used to turn on or off Ionizers automatically, when the Humidity changes, this protects sensitive semiconductor parts from static without operator intervention. Just plug the Ionizer into the back of the unit and set up the Ionizer for normal operations, then set the RH Relative Humidity Control System to the set point of the RH level required, this unit will then turn the Ionizer on and off as per the set point. 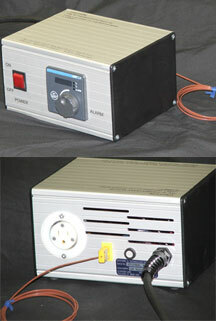 Over Temperature Alarm Cutout, this unit is used as a Secondary separate alarm and cutout of Hot Plates. The OTC Temperature Alarm Cutout will remove power from Alarmed conditioned Hot Plates that have exceeded the set points required for process. This unit is a self contained unit with an AC plug for the operating Hot Plate to plug into and a Thermocouple that must be attached to the Hot Plate in order to monitor the temperature. 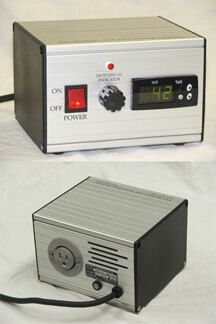 This Temperature Alarm Cutout can be used on Hot Plates that do not have Alarm cutout or as a Secondary Temperature Alarm.